FUD & FOMO is the first art project by Eivind Kleiven exploring the concept - value of art. With this project Eivind propose a battle theory of value. The theory is expressed using two sculptures sharing a monetary value that can only be retrieved by destroying at least one of the sculptures. If one is destroyed and its monetary value withdrawn, then the monetary value of the remaining undestroyed sculpture will disappear immediately and only its value as art remains. 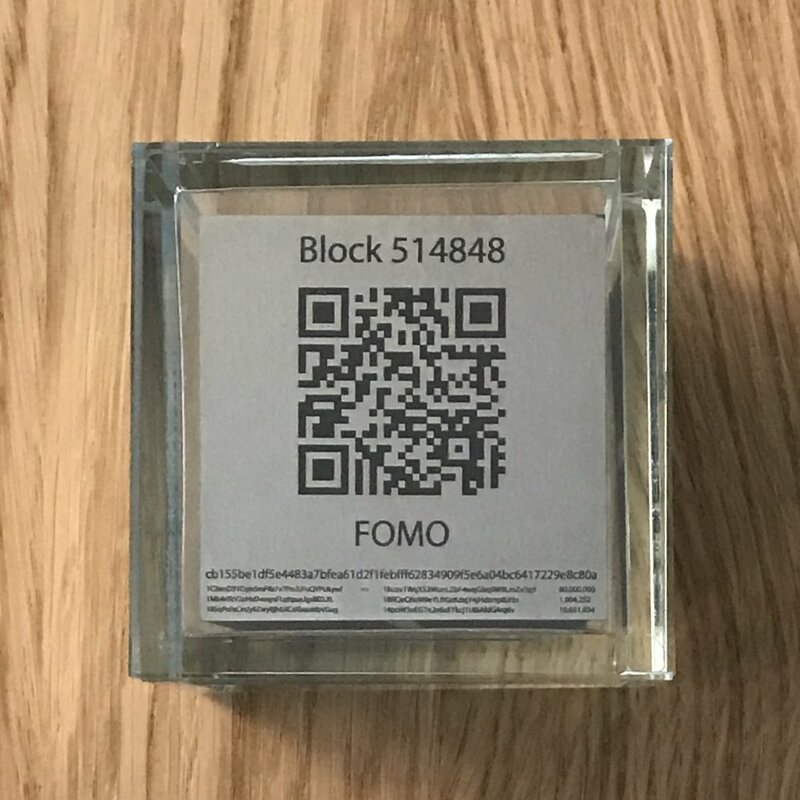 The first two sculptures in this project are titled “FUD Block 514848” and “FOMO Block 514848”. 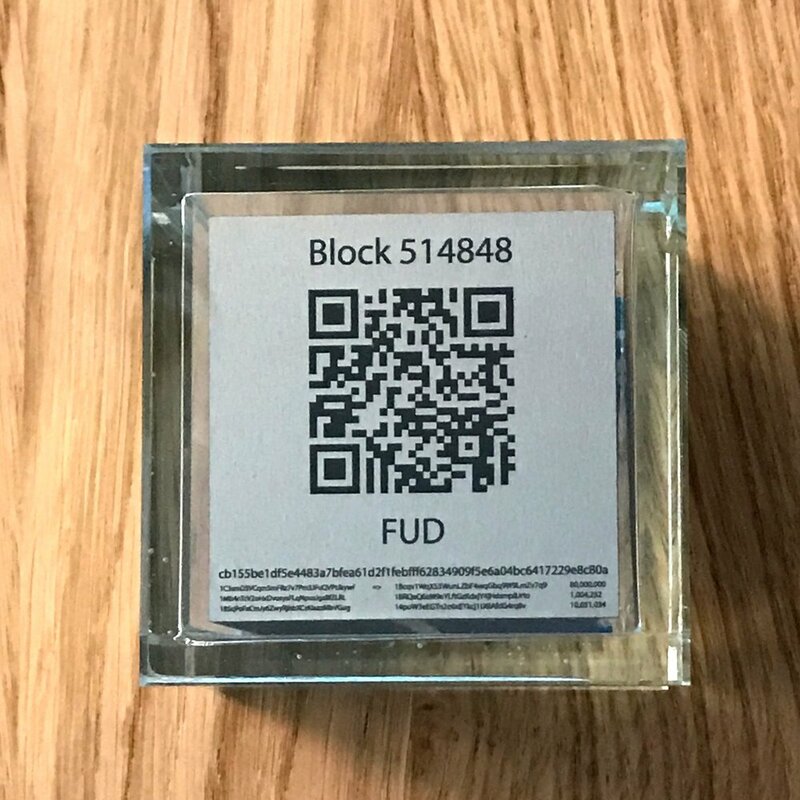 They are two 5x5x5 cm tungsten* cubes engraved with Bitcoin block 514848 transaction hashes encapsuled in glass. Both topsides are engraved with the same public Bitcoin address. The corresponding private key, which is necessary to withdraw the monetary value, is sealed inside a 200 NOK bill glued to the cube and to the glass that they are encapsuled in. The serial number of the 200 NOK bill inside FOMO is 2401224579 and the serial number inside FUD is 2401224580. The two pieces are identical except for their engraved names: FUD and FOMO**. * Tungsten has almost the same density as gold and is used by the mining industry due too its hardness. Bitcoin is created by a process called mining and is by many considered to be a store value such as gold. Each sculpture weighs 2.7 kg. ** Fear, Uncertainty and Doubt (FUD) and Fear Of Missing Out (FOMO) are terms often used in connection with investment to describe selling and buying behaviour that drives prices up or down.